Peak time: about 11:33 +/- 20 minutes UT (= 04:33 a.m. Pacific Daylight Savings Time). Once in a lifetime crossing of the dust trail of a known long period comet (comet Kiess). Find out where Kiess is now: here. 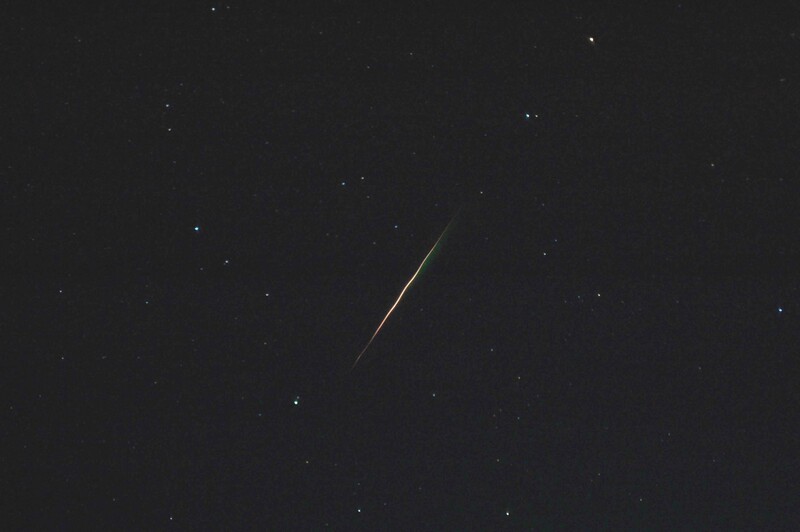 When you make a wish, consider that each meteoroid was released at some unknown moment during the period 36 B.C. - A.D. 45. 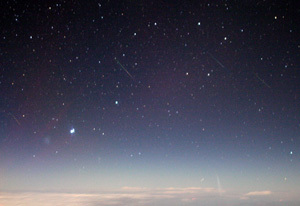 Banner photo shows part of a 2001 Leonid meteor shower composite by Shusaku Tago of Japan (with permission). Preliminary results: Zenith Hourly Rates derived from the near-real time flux measurements on board the South Plane in the Aurigid MAC mission. Photo: NASA/SETI Institute. 2007 Dec 10 - First results of the Aurigid MAC were presented at the American Geophysical Union Fall Meeting. 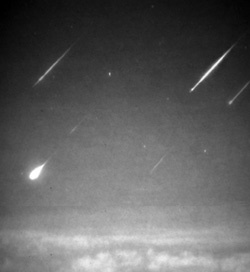 2007 Sep 18 - Pluie de meteores des Aurigids (l'Observatoire de Paris, France). 2007 Sep 17 - Results from ground-based observations by the Armagh Observatory team. One group observed from Lick Observatory, where Carl Clarence Kiess discovered the comet, another group in the company of a team from the German Arbeitskreis Meteore was at Fremont Peak Observatory. 2007 Sep 04 - Observing the Aurigid meteor shower (ESA). 2007 Sep 01 - Cloudbait Observatory reports a single-station radiant at R.A. = 92.4 +/- 1.4 and Decl. = +38.4 +/- 1.3 degrees apparent (which translates to R.A. = 92.7 deg., Decl. = +38.5 deg. Geocentric). We thank all observers that contributed reports and images so far. If you, too, captured Aurigids on digitial images, even faint ones, please send those (one at a time in full resolution) to Dr. Peter Jenniskens: pjenniskens [at] seti.org. A large number of reports have come in (to our email address, to Spaceweather.com, and to the meteorobs mailing list) and we are gradually organizing these reports into an overview. Please keep tuned. The following people contributed reports on forward radio meteor scatter observations: Andy Smith (UK), Cris Blak (Romania), Esko Lyytinen (Finland), Felix Verbelen (Belgium), Gilberto Klar-Renner (Brasil), Howard Sharpe, Jeff Brower (Canada), Michael Boschat (Canada), Patrick Mergan (Belgium), Sam Barricklow (Texas), Thomas Ashcraft (New Mexico), Ilkka Yrjola (Finland). The 2007 Aurigid shower was a spectacular display for 24 researchers onboard the NASA sponsored Aurigid MAC mission. 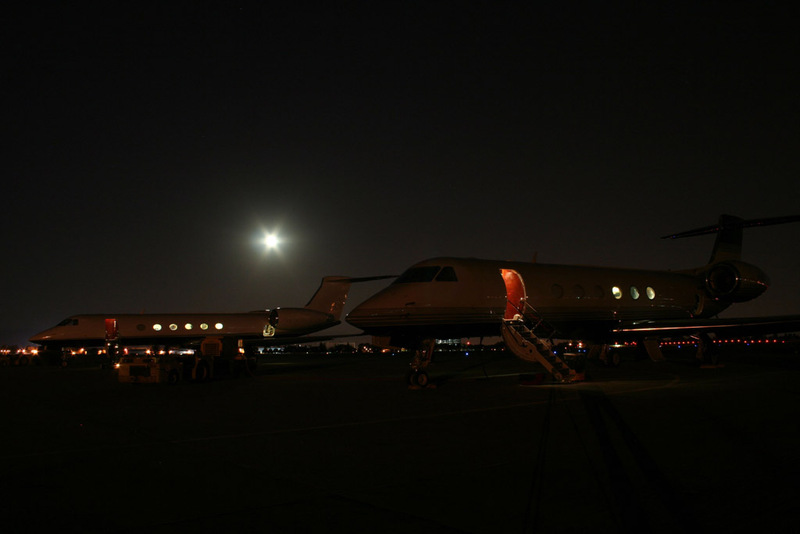 The two Gulfstream GV aircraft departed on time and travelled from Utah towards California and on to the Pacific Ocean. Results from our near-real time flux counts indicate that the shower peaked around 04:15 PDT (11:15 UT), which was 18 minutes earlier than predicted. The peak rate was close (within a factor of two) to that advertised. The shower lasted at least two hours, from about 3:15 to 5:15 PDT, but may have started earlier and was still ongoing at 6 PDT. As expected, many Aurigids were as bright as the brighter stars on the sky. 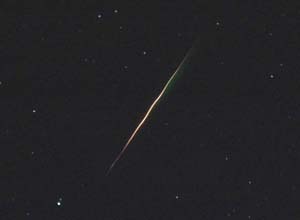 Some meteors were bluish or greenish in color, as reported for the 1994 return. 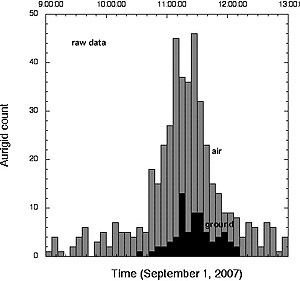 Many, many meteors were recorded during the mission, and a large number of spectra were measured. This is the first time in history that an Aurigid shower was predicted, and the result has been a feast for data starved astronomers. Composite image of Aurigid shower with 15 Aurigids by Jason Hatton, ESA/ESTEC. The meteors span the period 11:04:44 to 11:50:54UT 1st September 2007 (a 46 minute period covering the peak). Notice the one Aurigid that seems to fall behind the horizon! A satellite trail is visible just below alpha Columbae. Photo: NASA/ESA. 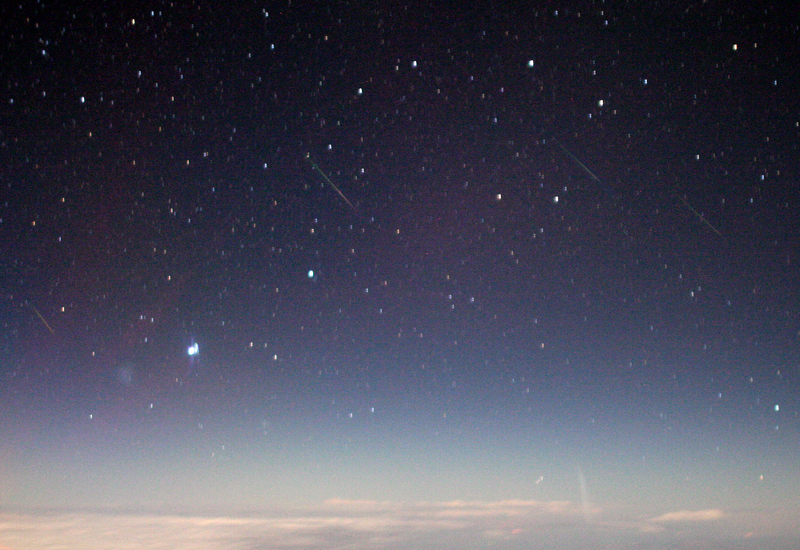 Some of the same Aurigid meteors as seen from North Plane in a compilation by Peter Jenniskens, SETI Institute. Notice irregular light curves. Photo: NASA/SETI Institute. Spectrum of an Aurigid. The orange Aurigid meteor on the left was colored by red air plasma emissions, with a hint of orange from sodium, green from magnesium and blue from iron, in a photograph by Julian Nott, U.C. Santa Barbara Photo: NASA/UC SANTA BARBARA. A high dispersion spectrum of an Aurigid by Ron Dantowitz of Clay Center Observatory. Photo: NASA/CLAY CENTER OBSERVATORY. This graph by Jeff Brower of Kelowna, British Columbia, Canada, shows the rate of meteors measured by listening for reflections of a distant 100 kW radio station at 61.260 MHz. Photo: GLOBAL-MS-NET/Jeff Brower. 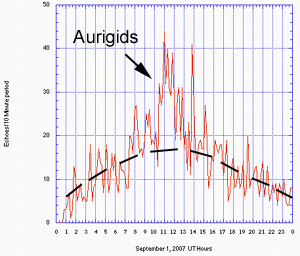 Aurigids in daytime. Listening to radio reflections in daytime, Esko Lyytinen detected the outburst in Finland. 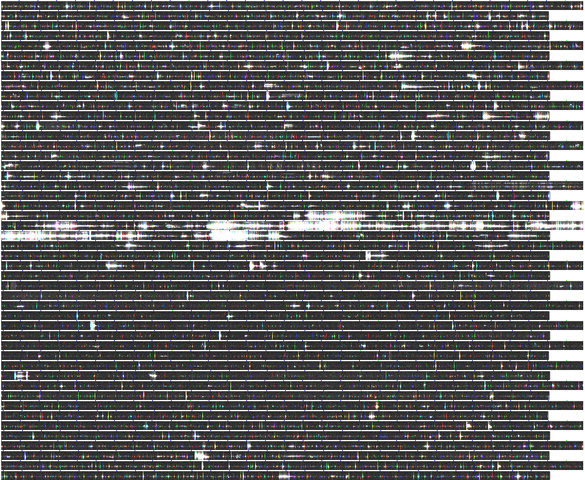 He recorded meteor scatter from a Moscow TV carrier at 49.747 MHz at a distance of about 800 km. Each set of two strips is a 1-hour period of observations. Lyytinen, too, was pleased to see his model predictions confirmed. Photo: GLOBAL-MS-NET/Esko Lyytinen. 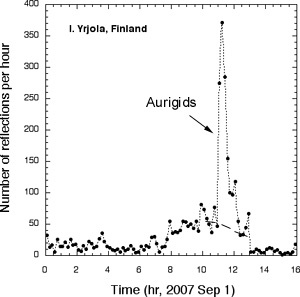 These are the meteor reflection counts by Ilkka Yrjola in Kuusankoski, Finland. He also recorded the 1994 Aurigid outburst with the same instrument. Photo: GLOBAL-MS-NET/Ilkka Yrjola. For more images, see this site of Spaceweather.com. Between 03:00 a.m. and 06:00 a.m. PDT (10 - 13 h UT), we will periodically phone in from the aircraft to report on the observations in near-real time. 2:45 a.m. Good morning! I'm Barbara Vance from the SETI Institute, and will be transcribing the communications from the planes. The phone connection is working, and we're just waiting for our first reports. 2:58 a.m. Delia from the North Plane just checked in to report that they are turning the plane around and that they have already seen 4-5 meteors, some coming from the Big Dipper region. 3:14 a.m. Delia from the North Plane reports ZHR of 15. 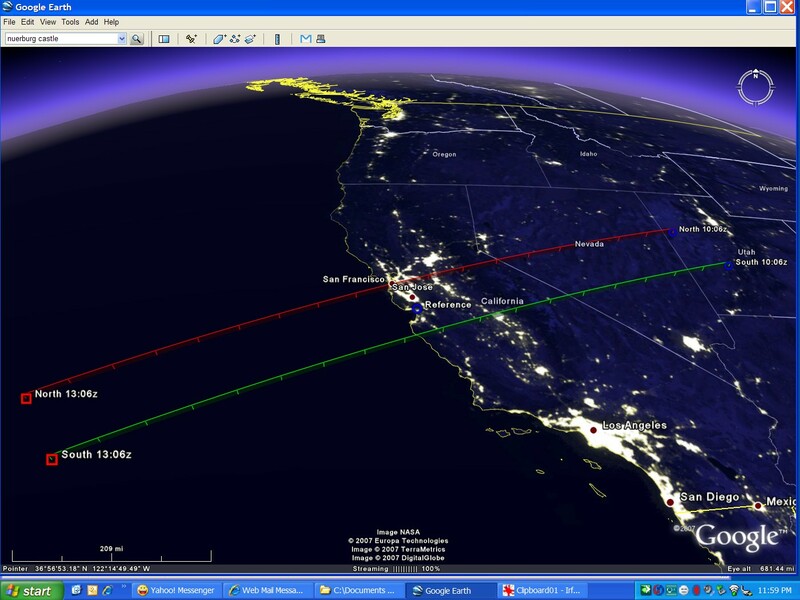 The plane has changed directions and some observers have seen 3-4 meteors since the turn, depending on the viewpoint. Some are intensely looking through the forward view, but have yet to see any objects from that aspect. 3:24 a.m. Delia from the North Plane reports ZHR of 14. The sporadic rate is 11. Some people saw a couple of objects at 10:21 UT. She reports that everyone is very focused, concentrating through their goggles. One wouldn't believe that it is so early in the morning here in California! 3:38 a.m. Delia from the North Plane reports ZHR of 10. The sporadic rate is 9. The plane is slightly off course, and a few people saw what is thought to be a sporadic at 10:29 UT, coming from a different direction. 3:55 a.m. Delia from the North Plane reports ZHR of 28. The sporadic rate is 9.5. The activity is picking up; one person reported seeing 3 in 10 seconds! Peter Jenniskens states that the Perseids are not currently active, in case anyone was wondering. All cameras on board the aircraft are active, and all instruments are online in anticipation of the peak. 4:09 a.m. Delia from the North Plane reports ZHR of 82 - above the level of the Perseids! The sporadic rate is 9. 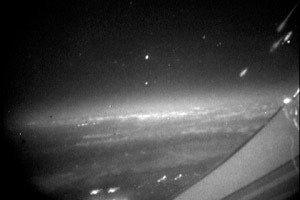 Many observers, including Peter, have had naked eye observation of the meteors through the plane windows, and there is LOTS of activity! As Delia and I were talking, there was a collective gasp that was heard from the observers. Maybe a particularly spectacular trail? 4:20 a.m. Delia from the North Plane reports ZHR of 59 (but they just got a flurry, so this is fluctuating). The sporadic rate is 20. Delia has seen not only her first object, but three with the naked eye, and is amazed to think that no one else in her lifetime will see this. It's about 10 minutes to peak... There are enough to start measuring spectra. 4:24 Chuck from the South Plane reports that the crew there is seeing a few every minute, and it's now a couple hundred an hour. They have multiple cameras working, and are capturing spectra as well. 4:32 a.m. Delia from the North Plane reports ZHR of 78. The sporadic rate is 6. Peak will "officially" occur in about a minute. Nake eye observation is fantastic - one was a huge streak against the sky. We both can't wait to see the photos! 4:45 a.m. Delia from the North Plane reports ZHR of 34. The sporadic rate is 8. The plane is around Sacramento, California at this time. The peak was determined to be at 11:15 UT, but is still going on. 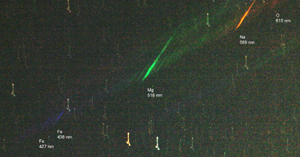 Peter and others report naked eye observation of streaks of bluish-green color. 4:49 a.m. Delia from the North Plane reports that the ZHR at peak (confirmed at 11:15 UT) was about 100. Current ZHR is 35, with a sporadic rate of 5. The plane is now flying over San Francisco, California. 5:40 a.m. No new reports have been recieved; the planes should be heading back for landing at NASA Ames Research Center at Moffett Field, California, shortly. Congratulations to Peter and the entire Aurigid MAC team! Update: Zenith Hourly Rates by visual observers on the ground are now reported by the International Meteor Organization, showing a peak rate of ZHR = 129 +/- 30 per hour at 4:17 +/- 10 minutes a.m. PDT (= 11:17 +/- 10 minutes UTC). Our near-real time flux reports were brought to you by a team of amateur meteor astronomers onboard the North Plane: Chris Crawford, Jane Houston-Jones, David Holman, and David Nugent. They used video headset displays to watch the video from our intensified cameras and counted meteors by mouse clicks. Those clicks were then tallied and automatically converted into ZHRs. These four observers recorded 460 Aurigids and 198 sporadic meteors. Many more Aurigids were covered by other cameras. Below is a graph of the raw counts, compared to the tally of four cameras on the ground (71 Aurigids). 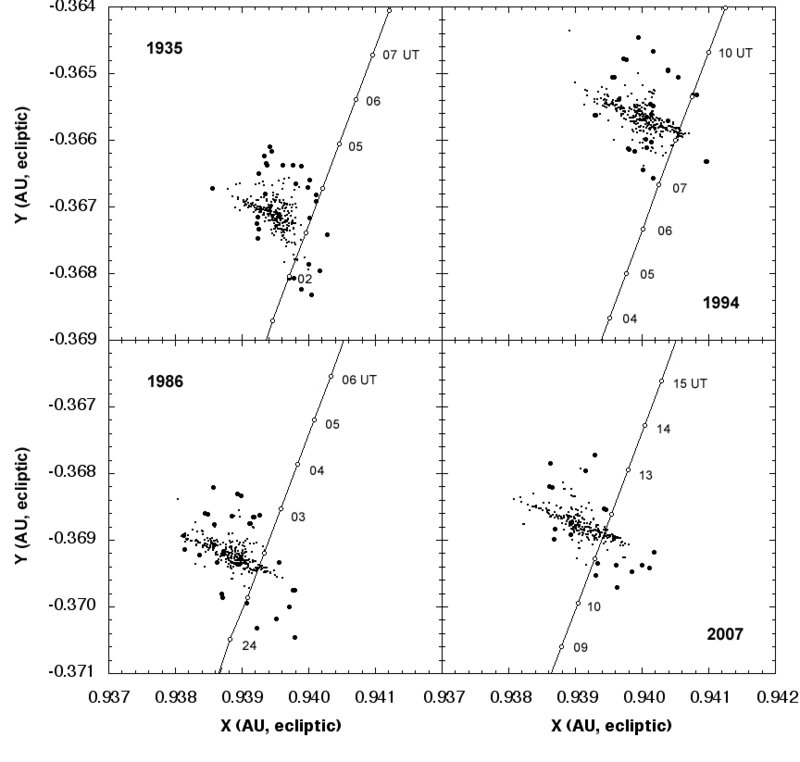 Raw count of Aurigids by four observers on the North Plane (using intensified cameras aimed low on the horizon, taking benefit from the low extinction near the horizon), compared to that of four cameras on the ground in California (two intensified and two low light level cameras). These are raw counts, not the Zenith Hourly Rates that are corrected for radiant altitude and detection efficiency. 2007 Aug 31 - Has the first Aurigid been spotted? 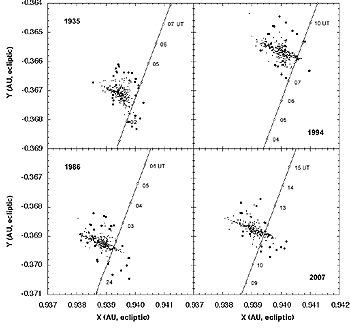 2007 Aug 29 - Will meteor showers become as predictable as Lunar eclipses? [Also see: Lunar eclipse of Aug 28 from Mountain View as photographed by Peter Jenniskens (36 Mbyte Movie) ]. 2007 Aug 23 - The comet: meteors date from around 4 A.D. The natural colors of a meteor's emission lines. This spectrum of a Perseid was photographed by Julian Nott (U.C. Santa Barbara) using a digital camera equipped with a 1000 lines/mm objective grating during the Aurigid MAC test flight on August 13, 2007. Photo: NASA/Julian Nott (www.nott.com). Some time in the 40 years or so around 4 A.D., comet Kiess (C/1911 N1) passed by the Sun, ejecting a cloud of dust particles. The comet returned in 1911, after completing one orbit. The dust particles were pushed by the Sun's light into slightly wider orbits and have been returning ever since, forming a thin ongoing stream of dust that usually passes just outside Earth's orbit. On occasion, the combined gravity of the solar system's planets moves this dust trail into Earth's path. 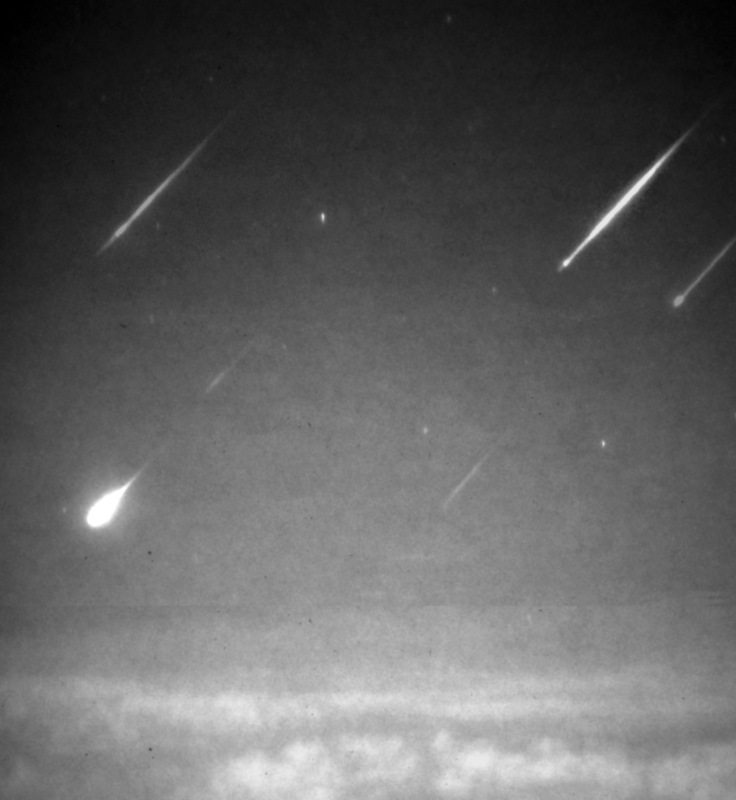 Earth encountered this 2000-year-old dust in 1935, 1986, and 1994, causing a meteor shower known as the Aurigids. This very rare shower will occur again on 1 September 2007. A brief shower of tens of meteors will radiate from the constellation of Auriga, many as bright as the brighter stars in the sky. 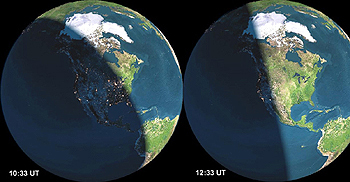 The Earth will be in the thick of it during the one hour centered on 04:33 a.m. PDT. The shower will be visible by the naked eye from locations in the western United States, including Hawaii and Alaska, from Mexico, and from the western provinces of Canada. This unique encounter could provide insights about how long-period comets lose large dust grains and about how to translate the observed dust trail crossing into physical data about the parent comet, and even provide more evidence for the hypothesized "pristine crust" of a comet. This crust would be the product of cosmic ray bombardment during the years when the comet was in cold storage in the Oort cloud. What is the best location for viewing the 2007 Aurigid shower? Now, you can calculate the answer yourself with the handy FLUXTIMATOR Java Applet below (courtesy of David Nugent and Peter Jenniskens). Choose the shower, the date, and a nearby location. The applet then calculates the expected shower rate. For Aurigids, choose "Aurigids" and date "Aug" "31-1" "2007". "DST" = Daylight Savings Time. The applet also allows you to see the difference between staying downtown or moving out into the countryside to a dark and clear location. All rates were calculated by taking into account the Moon light, which is pretty bad during the Aurigids. Disclaimer: Make sure that Java is enabled. The duration, peak activity and time of the peaks are based on recent numerical models and past Aurigid outburst observations, and may be in error by +/- 20 minutes in peak time, and an unknown amount in peak rate. The dust trail crossing was first recognized by Esko Lyytinen (Finland) and Peter Jenniskens (SETI Institute, California) during an investigation of potential dust trail crossings related to long-period comets. They put the peak time at 11:37 UT. They also found that the dust trail would not be crossed again in the next 70 years. 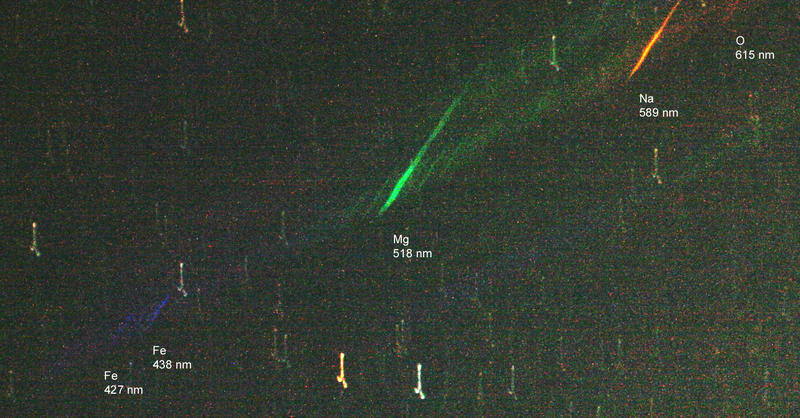 We know of no other known long-period comet with similar well-anticipated dust trail crossings. Full paper. That study followed from an earlier investigation by Dr. Jenniskens, where it was discovered that the dust trail of long-period comets is steered into Earth's path only once or twice every 60 years, in a pattern similar to the Sun's reflex motion. Full paper. That concept was subsequently proven by the successful prediction of the return of the alpha-Monocerotids in 1995. The 1995 alpha-Monocerotid outburst is still the best observed dust trail crossing from a long-period comet, but the comet itself is unknown. The shower consisted of meteoroids that penetrated 5 km deeper in Earth's atmosphere than other meteors of similar speed and the meteoroids lacked the element sodium, which is contained in the most volatile minerals. It was concluded that the Earth encountered meteoroids that originated from the pristine crust of a long-period comet. Only long-period comets still have such "pristine crusts" created by 4.5 billion years worth of cosmic ray exposure when the comets reside in the Oort cloud. The meteor shower provided the only direct evidence for the existence of these crusts. Full paper. Recent calculations by Jeremie Vaubaillon (Caltech) and Jenniskens show the distribution of dust in the trail at Earth orbit (Figure below). The trail moves in and out of Earth's orbit. It will be at exactly the same position in 2007 as in previous encounters. Full paper. More details here. Nrev = Number of revolutions since ejection. dE-dR = Miss-distance between center trail and Earth orbit (in astronomical units). Delta_a = Position along the comet trail, expressed as the difference in semi-major axis of the original meteoroid orbit shortly after ejection compared to that of the comet(in astronomical units). f_M = Dilution factor due to spreading of the grains. Sol. Long. = Solar longitude (J2000) of peak of shower. time in Universal Time Sep. 01, 2007 (hours:minutes). 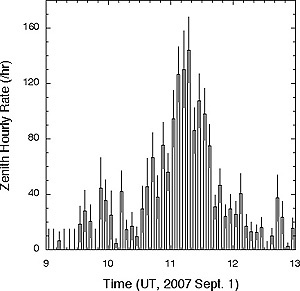 Jenniskens and Vaubaillon put the rate around ZHR = 200/hr during the 10-minute peak interval, three times the peak rate of Perseids, based on the handful of Aurigids that were seen in past outbursts. Unfortunately, observing circumstances were bad in prior sightings. In 1935, the shower rate was still increasing when twilight arrived in Germany and the Czech Republic, where the shower was seen by two groups of experienced observers (ZHR > 100/hr). In 1986, few sporadic meteors were seen by the one eyewitness, Istvan Tepliczky of Hungary, suggesting hazy sky conditions (ZHR ~ 200 +/- 25/hr). And in 1994, the shower was seen by only two observers, Bob Lunsford and George Zay near San Diego, CA, who had the radiant very low near the horizon (ZHR ~ 200 +/- 25 /hr). The previous results were derived from the orbit of comet Kiess provided in the 2003 SAO Comet Orbit Catalogue, which had the past perihelion time in 83 B.C., give or take a century. Since, the orbit of comet Kiess has been recalculated by J. Giorgini of JPL/Caltech, and the comet was now found to have visited the Sun last in 4 A.D., give or take 40 years (1 sigma uncertainty). Based on this new orbit, a new dust trail model was calculated by Vaubaillon, which moves the trail further into Earth's path. 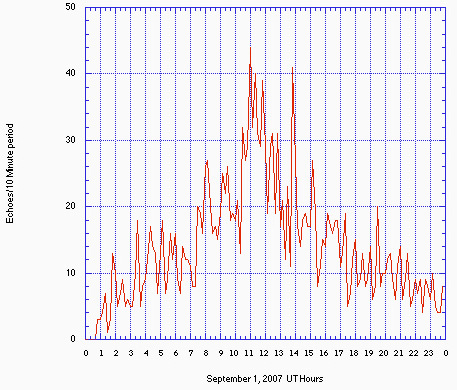 The peak time for the 2007 encounter remains nearly unchanged at 11:33 UT, September 1. These results have been submitted for publication to the Minor Planet Center. Of course, the Moon light will take some of that away, especially under hazy observing conditions and when the Moon is not blocked in the field of view. Best to put the Moon behind an obstruction, such as a telephone pole. Position yourself so that your head is in the Moon's shadow of that obstruction. In Hawaii, apparent rates will also be lower because of a lower radiant elevation (use flux applet above to see the effect on rates). A lower radiant results in fewer meteors, but longer meteor tracks. The outburst is best seen from the western United States, including California, Oregon, Alaska, and Hawaii. The figure below shows the moment of civil twilight for two different times, at the onset of the shower and towards the end. In San Francisco, the peak out the outburst is at 4:33 a.m. Pacific Daylight Time, while the beginning of civil twilight is at 6:13 a.m. PDT. Twilight conditions near beginning and end of observing interval. The Moon is waning gibbous, 4 days past Full Moon, with 76% of the Moon's visible disk illuminated. It will be high in the sky. Best viewing is in high altitude locations, where scattered moonlight does not brighten the night sky. 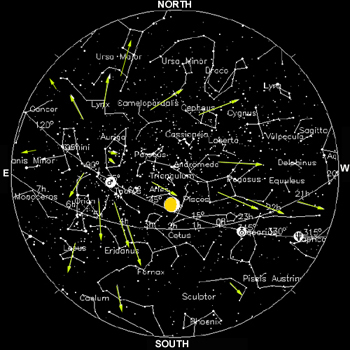 Watch towards the East and NorthEast. Artist impression of the view from San Francisco, CA. ESA/RSSD/MRG Aurigid observing campaign in Hawaii. Meteor Showers and their Parent Comets, Cambridge University Press (2006), book on meteor astronomy by Aurigid MAC mission P.I. Dr. Peter Jenniskens. + Photos of the Aurigid MAC mission by Eric James (NASA). + Photos of the Aurigid MAC mission by Franziska Harms. + Photos of the Aurigid MAC mission by Jeremie Vaubaillon. + Photos of the Aurigid MAC mission by Jane Houston-Jones. + Photos of the Aurigid MAC mission and ground observations by Brian Murahashi. 2007 Aug 31 news: Ready to go! Last night, we flew a 2-hour test flight with one of the planes to practice the storing away and setting up of cameras in flight, and to investigate the Moon's reflection in the windows. The Moon turned out not to be an issue this high, we were flying at 47,000 ft, where there is little scattering of the Moon light. All cameras operated as expected. Auriga rising. The constellation of Auriga rising above the horizon. Photo: NASA/Jason Hatton (ESA/ESTEC). We detected lightning, gravity waves in airglow, we captured spectra of Jupiter at 1000 frames per second, recorded calibration spectra on Capella, and took digital images of the rising constelation of Auriga. Check out this mpg video of the view from the plane, courtesy of Jeremie Vaubaillon (Caltech). 2007 Aug 28 news: Instrument upload has started at NASA Ames Research Center. 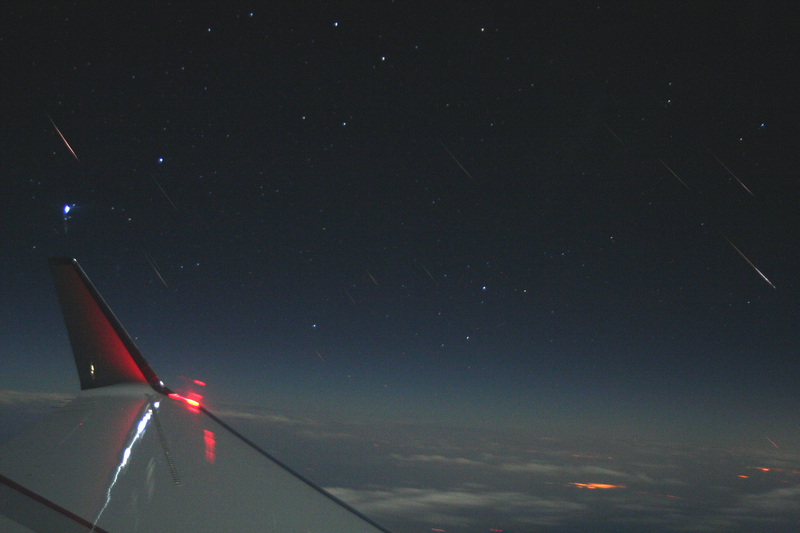 + Photos of the Perseids test flight by Eric James (NASA Ames). + Photos of the Perseids test flight by Jane Houston-Jones. 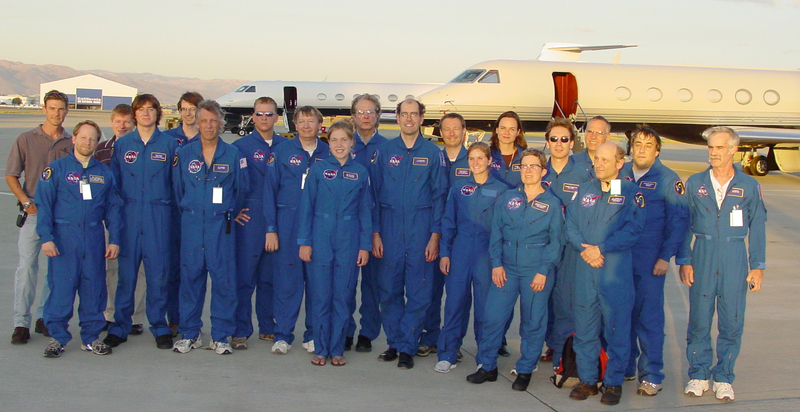 2007 Aug 13 news: Team ready to depart for Perseid test flight. 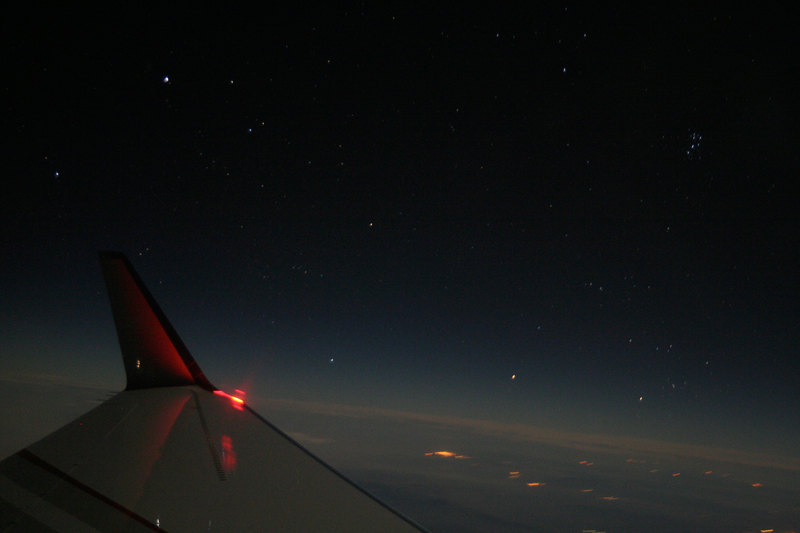 Fourteen of us departed at 01:00 PDT in the care of pilot Steve Elam, climbed to 45,000 ft, and learned that our intensified cameras detect the same faint meteors as in research aircraft. A new intensified color HDTV camera saw first light. Flux measurements were calibrated. The Perseids were glorious, sometimes two at the same time. First results (IMO). Other first impressions: There was very little vibration and the camera stands, which held the cameras in front of the windows, worked very well. No issues with frost or condensation. The aircraft did "rock", making long exposures for digital imaging difficult. Some other new technologies were found not to out perform older proven techniques. We learned a lot. We now know we have the tools to achieve the main mission objectives and look foreward to the Aurigid mission on September 1. "In 'Spirit of Saint Louis' Lindbergh wrote "Science, freedom, beauty, adventure. What more could you ask of life? Aviation combined all the elements I loved." It seems like a perfect description of this flight. Science of course, freedom to fly way above other traffic, a beautiful view of San Francisco from FL 470, a magic sunrise and of most of all beautiful meteors." - Julian Nott. 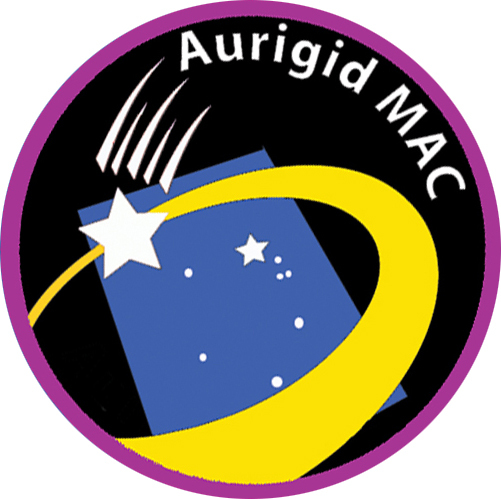 The Aurigid MAC mission is dedicated to observing the Aurigid shower from altitude, where the Moon is mostly out of the picture, and where the low extinction near the horizon creates a large surface area for counting meteors and for measuring spectra for meteoroid composition. Some of the meteors will be observed stereoscopically for measuring the meteoroid penetration depth. The proposed flight plan would take the aircraft to Utah, then turn around and on parallel trajectories follow the Earth's shadow. At the peak of the shower, the two aircraft will be over California. Two privately owned Gulfstream GV aircraft are made available for this mission, providing a total of 21 windows to the shower for 24 participating researchers and volunteers. The mission will include ground-based observations by national and international teams (green dots on map above). Participating scientists (air and ground) are from NASA Ames Research Center, the SETI Institute, Utah State University, the USAF Academy, Lockheed Martin, UC Santa Barbara, ESA/ESTEC (The Netherlands), I.M.C.C.E. (France), Universitaet Stuttgart (Germany), Armagh Observatory (U.K.), and others. Media inquiries should be directed at the NASA Ames Public Affairs Office: jbluck [at] mail.arc.nasa.gov. For an award winning 50 minute documentary of a previous meteor observing campaign: Chasing the Fire (premiered at 2007 Houston Film Festival, 1st in documentary, Special Jury Remi award), contact NASA Ames Video and Graphics Branch. Visual observations: count meteors in 1-minute intervals. Do not change viewing direction, keep Moon out of field of view. The Aurigid Meteor Observation Project explains how to use a laptop to do the counting for you. Photographic observations: use a digital camera with a low f-number lens (diafragm at f2.8 or less), set at ISO 1600, and take series of 10 second exposures of about 50 degree field of sky (not too big). Set camera such that as many as possible stars are visible. Video observations: use camcorder to film small portion of the sky containing many bright stars such as Orion (make sure stars are visible). Do not change viewing direction. Report your observations to: pjenniskens [at] seti.org. 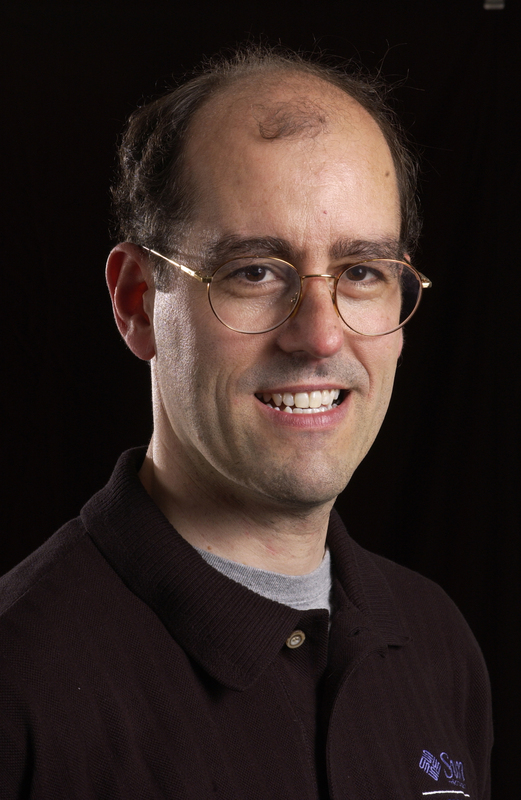 Astronomer Dr. Peter Jenniskens is a research scientist with the Carl Sagan Center of the SETI Institute. He is an expert on meteor showers and author of the 790-page book " Meteor Showers and their Parent Comets". He has earlier led observing campaigns to explore the 1998 - 2002 Leonid storms and the reentry of the Genesis and Stardust Sample Return Capsules.